I’m a huge advocate of cooking from scratch for the many reasons that you’ll read below, but I’m not here to make anyone feel guilty. I know life gets busy. I know sometimes it’s just better to eat out. I keep convenience food in my freezer for nights that I just can’t get dinner on the table. I’m grateful that we live in a world that offers such conveniences to us, but I don’t think they should be used everyday. I think we should at least try to cook from scratch because when we don’t prepare our own food we’re losing out on our health and on the experience of creating something with love for ourselves and our families. So keep reading for 6 Reasons You Should Cook From Scratch. Most of us know that convenience food is filled with dyes, chemicals and preservatives that aren’t good for our bodies. They’re also normally filled with tons of salt, fat and sugar that aren’t doing us any favors. When you cook from scratch you are in control of what’s going into your food and the mouths of your loved ones. Having someone else prepare your food or buying it pre-packed in the freezer section is great when you need it, but it comes at a cost. Cooking from scratch will almost always save you money. I could feed my family many times for the price of eating out for one meal. If eating out is a temptation for you then you should check out my post 6 Tips to Avoid Eating Out. See also 35 Frugal Recipes for When You’re Broke. Every time we get take out or fast food, we’re creating tons of waste. Think about all those cups, wrappers, utensils and napkins that will get used for about 10 minutes and then thrown into the landfill. When we purchase ingredients from the grocery store instead we will create way less waste per meal than eating out. For more information on cutting down on waste, see 10 Easy Ways to Reduce Food Waste. Of course most of us know that homemade food just tastes better than convenience food. If you don’t believe me, try the following recipes and compare them to store-bought. 3-Ingredient Strawberry Freezer Jam, Homemade Ham & Cheese Pockets, Southern-Style Biscuits, Bean & Cheese Freezer Burritos. I believe we were made to have a connection with our food whether that be in the growing, harvesting, or preparing. Cooking from scratch can be very therapeutic and good for the soul. Something magical happens in the kitchen when food is prepared with love for our families. Lives are impacted, traditions are passed down and memories are made. Like I mentioned above, cooking is good for the soul. Think back to your childhood. Do you remember your grandma, aunt or mom preparing food for you? What did it smell like? What did it taste like? Did they include you in the process? These kinds of things shape and ground us. When someone we love prepares food for us or we prepare food for someone we love we’re creating memories, traditions and a strong family bond. I hope this list has inspired you. 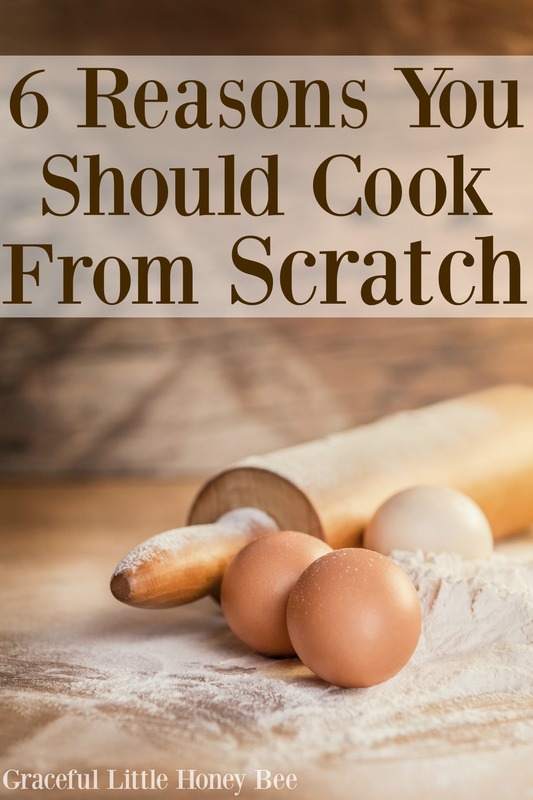 See the articles below some great scratch cooking recipes.